About one in nine people globally still suffer from hunger, with the majority living in Africa and Asia. The world’s forests have great potential to improve their nutrition and ensure their livelihoods. In fact, forests could be essential to global food security, particularly when considering the importance of diverse, nutritionally-balanced diets. Forests are key to protecting biodiversity, and for mitigating the effects of climate change. This is well known. However their contribution to alleviating hunger and improving nutrition has been somewhat neglected. A recent study by the Global Forest Expert Panel on Forests and Food Security, which I chaired, shows how forests and trees can complement agricultural production and give an economic boost to some of the world’s most vulnerable regions. Tree foods are often rich in vitamins, proteins, and other nutrients and are associated with more diverse diets. For example, the iron content of dried seeds of the African locust bean and raw cashew nut are comparable with, or even higher than that of chicken meat. Trees in home gardens, widespread in Africa and Asia, increase fruit and vegetable consumption. Wild meat, fish, and insects are also important forest food sources. Insects are an especially cheap, abundant source of protein and fat. Caterpillars are great for vitamins and minerals. Particularly in South-East Asia, many forests and agroforests (tree-based farms) are managed by local communities specifically to enhance edible insect supply, such as the management of sago palms in Papua New Guinea and eastern Indonesia to support grub production. Forests are also essential for firewood and charcoal. In developing countries, 2.4 billion people still use wood-fuel for cooking and heating. In India and Nepal, even better-off rural households depend on it. The volatile and often high prices for other energy sources suggest this situation is unlikely to change for some time. Access to cooking fuel provides people with more flexibility in what they can eat, including more nutritious foods that require more energy to cook. Trees offer a multitude of ecological services. For instance, they support bees and other pollinators, which are essential for crop production including on farmland. They also provide animal fodder that enables communities to produce meat and milk, and protect streams and watersheds as habitat for fish. Close to one out of six people directly depend on forests for their food and income, and it is important to recognise the rights of local people to these livelihood options. 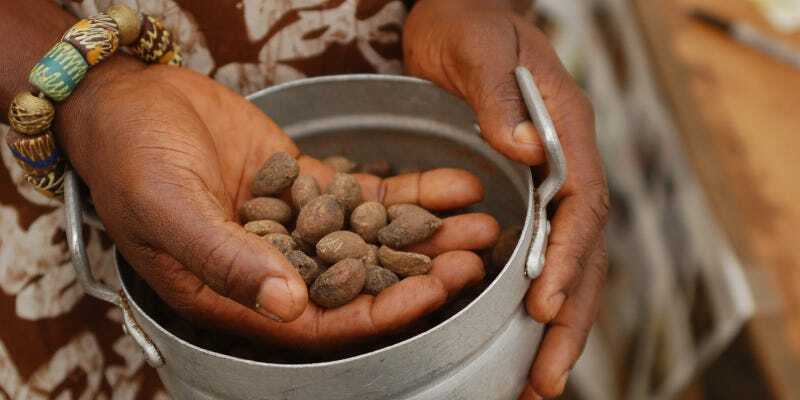 In the Sahel, for example, trees can contribute as much as 80% to household incomes, especially through shea nut production. Novel initiatives are attempting to develop new tree commodities to supply the poor with sustainable incomes. For example, poor producers in Tanzania are engaged in a global effort to produce the seeds of the Allanblackia crop, which yield an edible oil. A private–public partnership known as Novella Africa is developing a sustainable Allanblackia oil business that could be worth hundreds of millions of dollars annually for local farmers. Although forests are not a panacea for global hunger, they play a vital role in complementing crops produced on farms. This is especially important when the staple food supply is impaired by droughts, volatile prices, armed conflicts, or other crises. While large-scale crop production remains important, it is highly vulnerable to extreme weather events, which may occur more frequently under climate change. Tree-based farming can adapt far better to such calamities. During periods of food shortage triggered by such events, forest foods can provide a vital safety net, especially for the poorest households. This forest-farm link also means that the loss and degradation of forests exacerbate the problem of food insecurity. Losing forests jeopardises “ecological services” such as a clean water supply, crucial for crop and livestock production. Managing landscapes on a multi-functional basis that combines food production, the maintenance of ecosystem services and other land use services should be at the forefront of efforts to achieve global food security. In the lead up to the UN’s finalisation of the Sustainable Development Goals later this year, the contribution of forests and tree-based systems to the “Zero Hunger Challenge” needs to be emphasised. They can be managed to provide better and more nutritionally-balanced diets, greater control over food inputs – particularly during lean seasons and periods of vulnerability (especially for marginalised groups) – and deliver ecosystem services for crop production. It will be a critical element of the responses to global hunger. Bhaskar Vira is Reader in Political Economy at the Department of Geography and Fellow of Fitzwilliam College; Director, University of Cambridge Conservation Research Institute at University of Cambridge. This article was originally published on The Conversation. Read the original article. Image by Erik Hersman under Creative Commons license.